Matar Paneer is a popular North Indian vegetarian dish. It is an often prepared dish at our home for dinner. 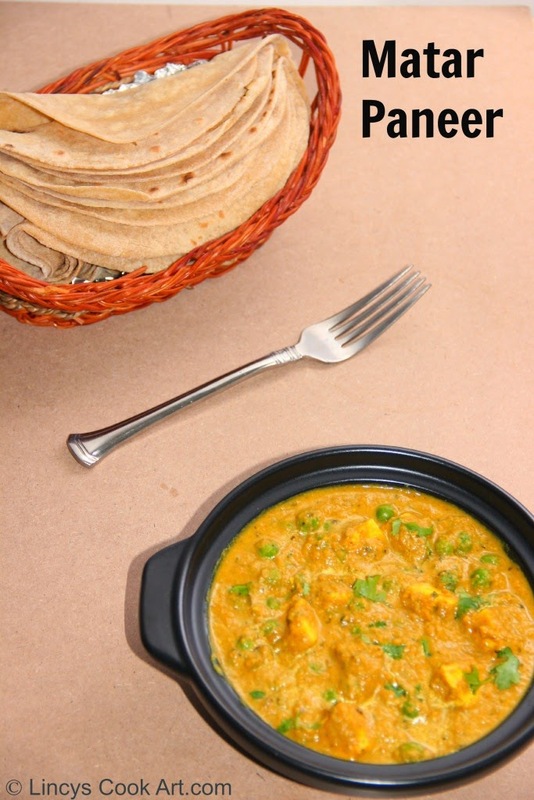 Easy to make side dish for all types of rotis and parathas. You can use fresh peas and fresh paneer also. Both if you are using fresh also does not take time to cook. I use generally frozen peas and frozen paneer for this dish. The frozen peas and paneer really come handy when I am run out of time or if I feel lazy to cook. Most of the times I wont thaw the peas. I just add some normal water in the peas and rinse, which itself enough for me to thaw the peas. To make masala also I grind onion, ginger, garlic, tomatoes together and make a paste. I use cream to make this dish super easy. If I don’t have cream in fridge I use milk or thick coconut milk to make this dish. Soak cashewnuts in water and grind as a smooth paste. Heat oil in a pan and add bay leaves along with jeera and fennel seeds. Add the ground paste and cook for about five minutes, till the oil separates to the top. Add turmeric powder, chilli powder, coriander powder and garam masala, cook till the masala smell leaves. Now add the peas, little water and salt. Cook for two minutes. Reduce the flame, add the ground cashew nut paste and cook for a minute. Add the kasuri methi and cook for a minute. Then add thick cream or milk /coconut milk and just heat the mixture and switch off the gas and sprinkle coriander leaves. Serve with any type of roti or paratha. Note: You can grind onion, ginger and garlic together and tomato as a separate puree. Cook the onion ginger garlic paste first then cook the tomato puree. Tomatoes can be blanched and pureed also can be used to make this gravy. Marta paneer looks fabulous.. drooling one..
Matar paneer looks lovely and nice clicks. Beautiful clicks.......sure it is delicious! Yumm yumm as usual detailed recipe . Yum to the thick delicious masala. Definitely bookmarking. Perfect curry..i know even i do go towards the frozen items.. when i go for shopping in stores..which makes cooking easy..Thanks so much for linking to my event.Looking for more..
Looks so delicious! Lovely dish! tempting curry makes me drool!!! Beautiful clicks.. perfect with any flat breads. you have done so well.. they look just brought frm a good restaurant.. Perfect for your soft rotis.I love it.